Marchionne helped stoke speculation about Jeep's future by saying FCA could spin off more divisions like it did with its Ferrari supercar unit. DETROIT/MILAN -- While automakers around the world covet Jeep for its strong growth and fat profits, Fiat Chrysler Automobiles sees potential for much more, banking on the rugged brand to vie with global giants like Toyota, Volkswagen and Ford. FCA is forecasting Jeep’s annual sales to jump about 30 percent next year to 2 million vehicles and predicts the brand could eventually deliver 7 million units a year as appetite for SUVs surges worldwide, CEO Sergio Marchionne has told analysts. That would continue impressive growth for what was once a niche offroad brand, with little more than 300,000 deliveries in 2009, when Fiat took control of Jeep as part of its acquisition of Chrysler. Even if Marchionne has plenty of reasons to see more growth ahead for SUVs, that level of expansion would be unprecedented. Jeep would need at least one model to sell more than 1 million a year. Only the Toyota Corolla, an affordable bread-and-butter compact that’s unlike anything Jeep offers, averaged that much global volume since the start of the decade, according to IHS Markit. While Marchionne, 65, helped stoke speculation about Jeep’s future by saying FCA could spin off more divisions like it did with its Ferrari supercar unit, the brand is all but untouchable, despite drawing interest from China’s Great Wall Motor Co., as first reported this week by Automotive News. Jeep has emerged as a the focal point of the automaker’s mass-market car plans, without which the company could scarcely attract a partner necessary to weather the disruption looming over the auto industry. Fiat Chrysler executives are considering options including a plan to spin off the upscale Maserati and Alfa Romeo divisions and its car-components operations, according to people familiar with the discussions. The company intends to keep Jeep to anchor the mass-market car business that also includes the Dodge and Ram brands, said the people, who asked not to be identified because the deliberations are private. A Fiat Chrysler spokesman declined to comment. Jeep, which is valued by Morgan Stanley at 23 billion euros ($27 billion), is already being transformed into a global player. SUV production started in India this year, following new plants in China, Brazil and Italy. 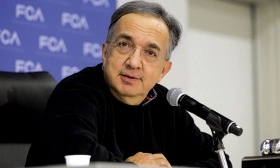 Marchionne sees SUVs and crossovers as potentially becoming a third of the global industry, or as much as 35 million vehicles per year. With Jeep’s cache and pedigree, it could capture a fifth of that market, he said on an earnings call on July 27. The brand’s lineup will expand with the addition of the Wagoneer, Grand Wagoneer and a pickup in the coming years, joining the Renegade, Compass, Cherokee and Grand Cherokee in showrooms. To reach Marchionne’s sales projection, those models would have to combine to sell about 50 percent more vehicles than what all of Fiat Chrysler delivered last year. “It seems pretty pie-in-the-sky at this point,” Richard Hilgert, an autos analyst at Morningstar, said of Marchionne’s long-term projection. Still, he noted most observers were dubious years ago that Jeep could expand to 2 million in annual sales by 2018, a projection that now looks reachable. Marchionne spoke plainly about the rationale against splitting Jeep from the rest of Fiat Chrysler on the earnings call, warning that the remainder of the company might not be healthy enough to survive. And without a robust and global Jeep, FCA has little to offer a potential partner, which would be needed to address strategic weaknesses. The automaker has the least fuel-efficient fleet in the U.S., and it’s poured less investment into technology like autonomous driving than bigger rivals. Spinning off Maserati, Alfa Romeo and parts divisions including Magneti Marelli, Teksid and Comau probably would help toward Fiat Chrysler’s goal to eliminate 4.2 billion euros in debt by the end of next year. The luxury-car operations could be worth as much as 7 billion euros, while the components businesses may fetch up to 5 billion euros, analysts estimate. Fiat Chrysler’s shares listed in both U.S. and Italy each closed at record highs Wednesday. The rise continued Thursday in Milan with Fiat gaining as much as 5.9 percent, giving it a market value of 18.8 billion euros. The deal speculation surrounding Fiat Chrysler has more investors realizing that the company is “exceedingly undervalued,” Hilgert said. The Milan-listed shares are still among the cheapest in the Stoxx 600 Automobiles & Parts index. “Now we’re starting to see the valuation perk up a bit and getting some interest,” Hilgert said. “There are some valuable assets in this organization after all."